Batman has a pretty dope belt. It has a bunch of gadgets that protect the caped crusader. REV'IT's new Safeway Belt doesn’t come with a bat-a-rang, but it will offer protection when you're riding your motorcycle through the streets of Gotham. 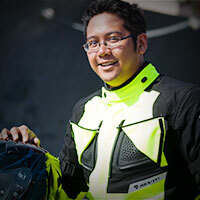 Riding with jeans is a bit of a gamble in safety, but you can stack the deck in your favor by using the REV'IT! Safeway Belt. In addition to holding up your pants, the belt provides an 8-inch connection zipper that works directly with REV'IT jackets. The zipper keeps the jacket from rolling up if you were to ever come off your motorcycle. Don't have a REV'IT jacket? No problem! 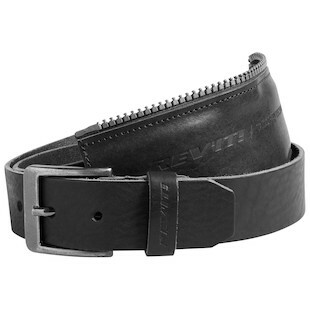 The belt comes with both sides of the connection zipper so you can have a tailor attach one side of the zipper to your favorite motorcycle jacket. Match up a REV'IT Redhook, Flatbush, or Roamer urban leather jacket to the REV'IT Philly, Jersey, or Memphis jeans to get the casual motorcyclist look without the casual level of protection. While you probably won't be riding around on a Batpod, you can still pretend to have a fancy utility belt that does more than just keep your pants at a socially acceptable height. The REV'IT Safeway Belt is missing Batman's grapple gun, but it will still protect you from the mean streets of Gotham.